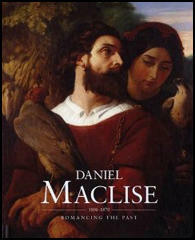 Daniel Maclise, the son of a former soldier, was born in Cork and baptised on 2nd February 1806. From an early age he showed an interest in drawing and after a brief spell working as a clerk he began studying at the Cork Academy and the Royal Cork Institution. His early work received high praise from Samuel Carter Hall, the editor of The Art Journal. On 9th August 1825 Maclise made outline portrait drawings of Sir Walter Scott. His biographer, John Turpin, has pointed out: "From these he worked up an elaborate profile portrait drawing of Scott which was lithographed in Dublin, bringing him his first public success. This enabled him to open his own studio in late 1825 in Patrick Street, Cork, making portrait drawings in an elegant linear style influenced by the neo-classical manner of the Cork-born painter Adam Buck. Maclise made a number of portrait drawings of officers and professional people, such as Richard Sheares and his niece Alice (1826)." In July 1827 Maclise moved to London and established a home at 12 Newman Street. He became a student at the Royal Academy. He won the gold medal for history painting, awarded for his Choice of Hercules in December 1831. Maclise's early portraits included those of Benjamin Disraeli, William Harrison Ainsworth and Charles Kean. Another important history painting was The Interview between Charles I and Oliver Cromwell (1836). John Turpin has argued: "Maclise's greatest strengths as an artist were his figure draughtsmanship and pictorial composition, talents that enabled him to deal with complex narrative subjects on a large scale. He could combine great detail with clear pictorial structure and his drawings and illustrations have a linear precision which is retained in the oil paintings. His weakness lay in a tendency to pile on descriptive detail with insufficient attention to the harmonizing possibilities of tone and colour. In the characterization of his figures, he tended to rely on stereotypes with insufficient individualism. His painting style is harsh and lacks painterly effect." William Maginn, the editor of Fraser's Magazine, commissioned Maclise to produce lithographed drawings of eminent literary or political figures. Over the next few years, under the pseudonym Alfred Croquis, he contributed eighty-one portraits. This included drawings of George Cruikshank, Samuel Taylor Coleridge, William Wordsworth, Thomas Carlyle, Walter Scott, James Leigh Hunt, Charles Lamb, Michael Faraday, John Russell, William Cobbett, Daniel O'Connell and Edward Bulwer-Lytton. The artist, Dante Gabriel Rossetti later commented: "I suppose no such series of the portraits of celebrated persons of an epoch, produced by an eye and hand of so much insight and power, and realised with such a view to the actual impression of the sitter, exists anywhere". In 1834 Maclise met John Forster who introduced him to a group of friends that included Charles Dickens, Charles Knight, Douglas Jerrold, William Makepeace Thackeray and William Macready. The men often took walking holidays together. This included trips to Richmond, Stratford-upon-Avon, Lichfield and Broadstairs. 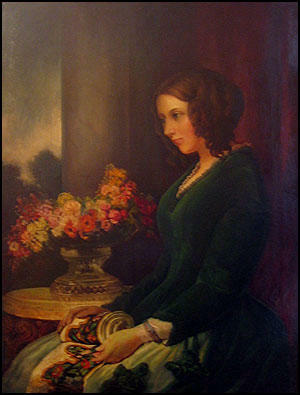 Dickens's daughter, Kate Dickens Perugini , later commented: "Maclise... was very handsome in person, and had a singular fascination and charm of manner, little personal attractions for which my father had invariably an almost boyish enthusiasm, and the charming warmth and geniality of his nature completely won my father's heart." Maclise was a confirmed bachelor and had a reputation as a seducer of women. In 1836 he had a liaison with Lady Henrietta Sykes, who had previously been the mistress of Benjamin Disraeli. Maclise painted a watercolour portrait of the Sykes family in medieval dress in 1837. The following year the affair resulted in divorce proceedings against Maclise by her husband Sir Francis Sykes. In July 1840, Maclise, Charles Dickens, and William Macready went to see the execution of Francois Benjamin Courvoisier, who had murdered his employer Lord William Russell. Dickens rented a room from a house that overlooked the scaffold outside Newgate Prison. Forty thousand people turned out for the hanging and over a million and a half broadsides about the murder and execution were sold (for a penny each). Although the servant from Switzerland, had confessed to the crime, Dickens had doubts about his guilt and wrote two letters to the press complaining about the behaviour of the defence lawyer. 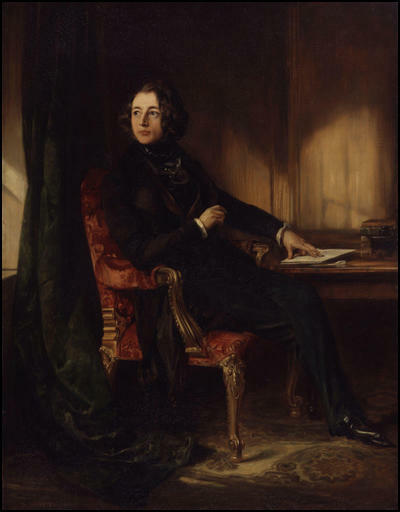 Dickens often communicated with Maclise about his work. In January 1841 he was writing about the death of Little Nell in The Old Curiosity Shop. He wrote to Maclise: "If you knew what I have been suffering in the death of that child!" He told William Macready: "I am slowly murdering that poor child, and grow wretched over it. It wrings my heart. Yet it must be." He told another friend, "I am breaking my heart over this story, and cannot bear to finish it." It has also been claimed that Maclise and Dickens visited prostitutes together. Michael Slater has claimed that along with Wilkie Collins "Dickens felt he could indulge himself in the mildly naughty badinage that was one of the epistolary games he sometimes enjoyed playing." In August 1841 Dickens went on holiday to Broadstairs and during this time he visited Margate. He wrote to Maclise that: "There are conveniences of all kinds at Margate (do you take me?) and I know where they live." Claire Tomalin has suggested: "The conveniences are prostitutes, and Dickens is telling Maclise he has located them in nearby Margate. It doesn't sound like a joke. Did Dickens go out and look for the Margate prostitutes simply to find out where they were for Maclise's sake? Or because he took an interest in seeing them and talking to them, for whatever mixture of reasons? Was he thinking of using their services himself?" Maclise distinguished himself as a book illustrator of texts by British writers. This included The Old Curiosity Shop (1840), The Irish Melodies (1845), The Cricket on the Hearth (1846), The Chimes (1845) and The Battle of Life (1846). He was also commissioned by Prince Albert to paint murals in the Garden Pavilion of Buckingham Palace. This resulted in being asked to paint frescos in the House of Lords. John Turpin has argued: "The culmination of the narrative histories and of Maclise's career came with the commission for The Meeting of Wellington and Blücher and The Death of Nelson for the Royal Gallery of Westminster Palace. Originally these were to be accompanied by sixteen other subjects from the history of the United Kingdom: he offered to undertake all of these works and was commissioned in 1858. He exhibited a cartoon, 45 feet long, of Wellington in May 1859 which drew the admiration of a number of his fellow artists, who presented him with a gold porte crayon.... The mural was completed in December 1861 and drew favourable comment, especially from F. G. Stephens in The Athenaeum. From 1863 to 1865 he worked on The Death of Nelson, which involved extensive naval research. Following the death of Prince Albert, who was a strong supporter of Maclise, the decorative programmes were cut back and his contract for the remaining works was cancelled, to his great distress." On the death in 1850 of his brother-in-law, Maclise took over the responsibility of supporting his sister Anna Banks and her family; his sister Isabella, who kept house for him, died in 1865. In his last years his heart deteriorated and he was largely confined to his home at Cheyne Walk. 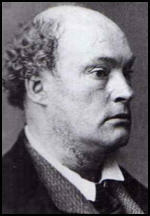 According to Michael Slater , during this period Maclise became "very much a recluse". Daniel Maclise died at his home on 25th April 1870 of pneumonia and was buried in Kensal Green Cemetery. At the Royal Academy dinner of 30 April 1870 Dickens paid a fulsome tribute to his old friend claiming that he "gallantly sustaining the true dignity of his vocation... at the last as at the first". Maclise... was very handsome in person, and had a singular fascination and charm of manner, little personal attractions for which my father had invariably an almost boyish enthusiasm, and the charming warmth and geniality of his nature completely won my father's heart.